Shane and his wife, Lisette, plus their Beagle, Bubba (who is a good boy), relocated from San Diego, California, to South Carolina to join us at Smokingpipes.com. It was when we asked about his hobbies and he responded, "whiskey, tobacco, writing, moving across the country, and listing my hobbies," that we knew we would all get along just fine. 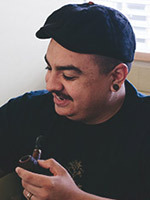 Shane makes particular use of his immense knowledge of pipes and pipe culture as the Director of Smokingpipes.com, overseeing Customer Service, Merchandizing, Estate Restoration and Low Country Pipe and Cigar, as well as having more fun than the rest of us combined by hand-selecting the pipes featured on our website (he refers to this activity as "finding pipes the right homes.") Liaising with pipe makers around the world while spending roughly half the year on the road, Shane plays several instruments adequately, but maybe none masterfully, and loves the music of David Bowie, Ornette Coleman, and Rachmaninoff. His favorite foods include albacore, espresso, Laphroaig of any variety, McConnell's Scottish Flake, watermelon, rye (both marbled, and distilled), and soft-boiled quail eggs. But especially clam chowder. He proudly supports Chelsea Football Club, and Boba Fett is, hands down, his favorite bounty hunter.